Every year, I get the masochistic pleasure of Christmas shopping for my family, a group of people who buy for themselves everything they want or need and possessed of picky consumer habits. So, what do you buy for people who already have everything and don't seem to like anything you get them? This is the first in a series of posts offering holiday gift ideas for just such a group of people. Good for: Pragmatic-minded people who like shopping, dining out, or going to movies at their own pace. Teenagers who would rather hit the Boxing Day sales and find their own treasures than receive another sweater. Not for: Absent-minded folks. Gift cards may have expiration dates, and if they're forgotten or misplaced, well, tough luck. 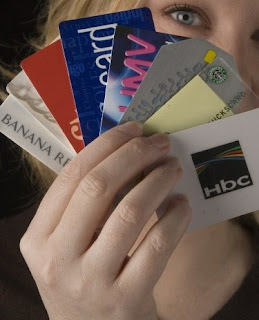 What to go for: Although gift cards come across as highly impersonal, this need not be the case. Just consider the recipient of the card and what they would most like. For example, I got my dad--a daily patron of his local Starbucks--a gift card loaded with $100. He thought it was a great idea: Not only did he not have to pay for his daily coffee, now he didn't have to fumble around with change everyday. Other good gift cards/certificates include ones to movie theatres, beloved restaurants, techie shops (they can splurge on a new camera or laptop, or buy DVDs), major department stores, or favourite clothing boutiques. Have you ever gotten someone a gift card or gift certificate? How did they like it? I looooove gift cards, to give and get. My faves: Starbucks, Forever 21, and Barnes & Noble! Gas stations also give out gift cards, which is a great present for anyone with a car! Plus, with the lower gas prices now, your card will stretch out longer. MizzJ and Megs, those are fantastic alternative ideas! I know a guy in my office who surprised his wife--a salsa enthusiast--with salsa classes for Christmas. He was just a beginner and she was a more experienced dancer, and seeing him make the effort to learn how to do something she enjoys was really sweet. It's probably worth noting retailers preparing for bankruptcy are still allowed to sell gift cards. You may wish to confirm that the company will still be around come January. I always tell my parents and grandparents to just go the gift card route because they've been known to give me really bad presents without gift receipts. I've gotten my mom gift cards. She's *waaay* too hard to shop for otherwise.